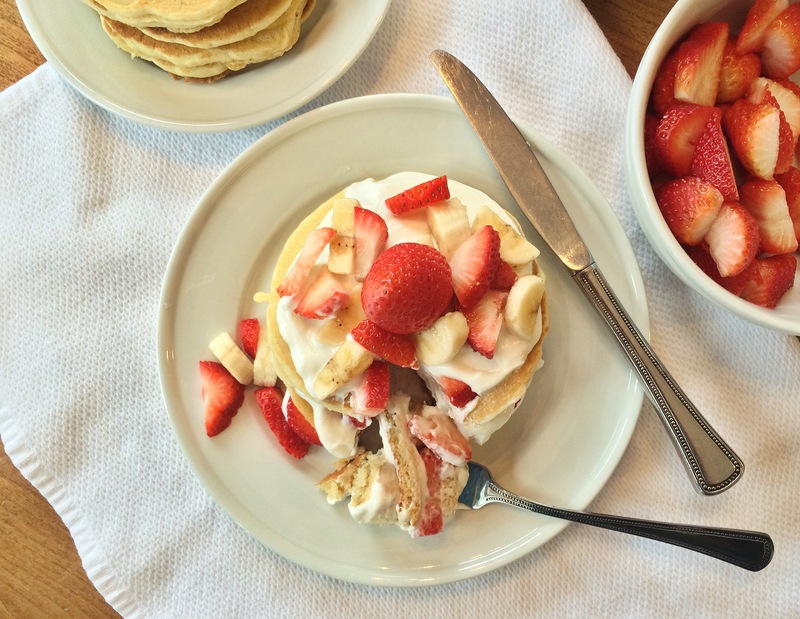 I don’t want a lot for Christmas…there is just one thing I need: These simple pancakes layered with strawberries, banana slices, and vanilla greek yogurt. Merry (early) Christmas to me! I am so sorry that I have not posted since Thanksgiving! Between finals, research papers, and meetings to close-off the Fall semester, I barely had a second to even enjoy a few minutes of my favorite Christmas movies without having to study during commercials. But thankfully, I watched all of “Santa Clause 2” last night without a single thing to stress about. Ah, the comfort of being home for the holidays! So, I assure you that I am back on my breakfast blogging grind for the holiday season and what better way to kick back into gear then with a stack of delectable pancakes?! These cakes are easy, filling, and really satisfy your holiday sweet-tooth cravings. Try them out and stay tuned for more holiday breakfast treats and maybe a few Christmas cookie recipes sprinkled along the way! Mix together pancake mix, cold water and vegetable oil. Pour about 3 tbsp. bater on hot griddle for each pancake. Bake until bubbles break over surface, turn an brown other side. 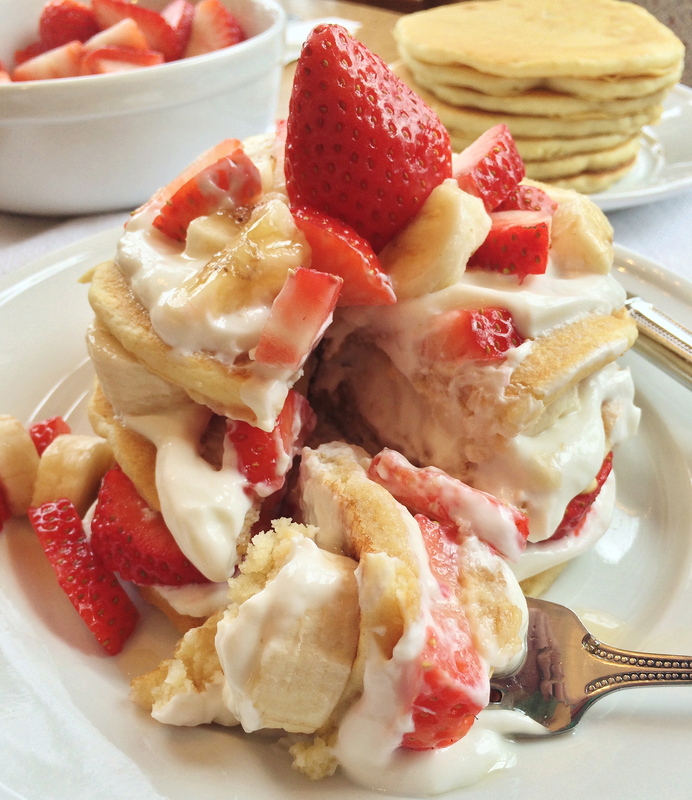 Cut up banana and strawberries. 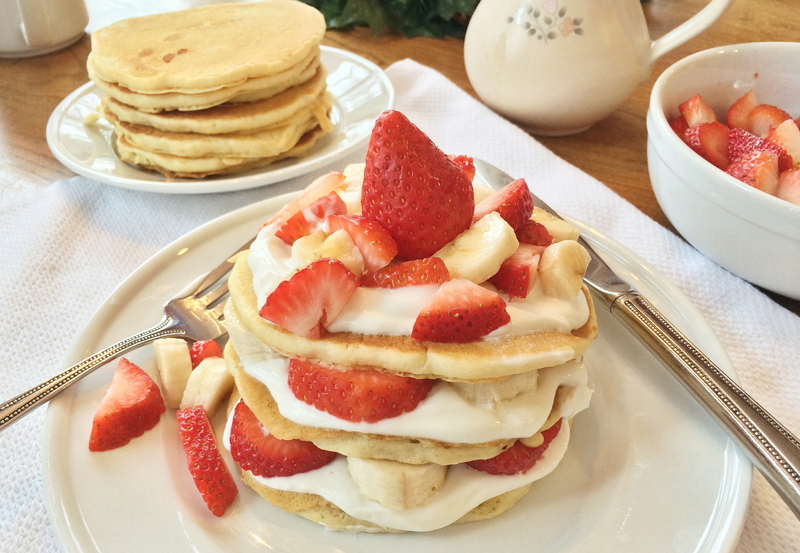 Once pancakes are made, layer atop each other with first layer of greek yogurt and second layer of strawberries and banana. Continue layering until your stack is as high as your heart desires! Bon appétit! Previous Post Need an apple-ing Thanksgiving dessert? Apple Crisp to the rescue!